A coach and four on the high-road 49 miles from London. Sally Mitchell (Dictionary of Equestrian Painters, (1985) p.172) says “no details are known of the life of John Cordrey. Most of the coaches he painted travelled from London to one or another part of the country, so it is tempting to think that he was London-based…”. Based on dated examples of his work, she estimates his birth at around 1765. If these two hypotheses are correct, then it seems likely that John Cordrey was born in 1757, when a child of that name was baptised at St. Martin-in-the-Fields, the son of William and Ann Cordrey. No other person of that name is recorded in Parish Registers of the Church of England 1750-1926 at the appropriate date, though a John Cordrey, perhaps the same person or perhaps a son, married Ann Harridan at St. Mary Stoke Newington on 3rd October 1816. The name is actually rare: only 173 people of this surname are recorded in England and Wales in the 1881 census, when the population was much larger than in c1800. A John Cordrey was buried at Stepney 24th April 1836; given 18th/early 19th century life expectancies, this is more likely to have been a son. 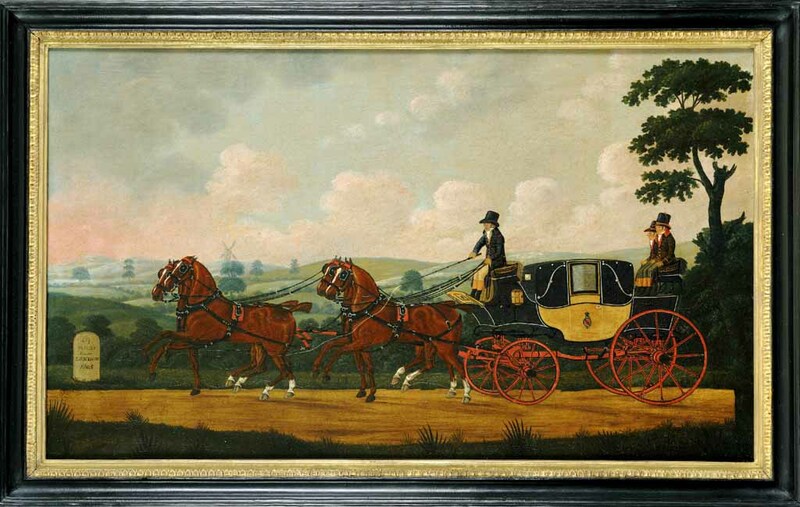 What we do know about John Cordrey is to be deduced from his paintings, which, apart from the occasional hunting scene, are virtually all depictions of stage- or mail-coaches and other horse-drawn vehicles. They are drawn in a bright, wholly naïf style typical of the late-Georgian folk-painter. He was, though, surprisingly prolific and numerous examples of his work survive. Cordrey’s painting vary little in concept: the horses travel from right to left and are silhouetted against the sky and in precise step with each other. Primitive though the execution of the paintings is, they are full of minute and exacting detail: it may well be that that Cordrey was also a coach-painter himself, for his knowledge of the coaches and their accoutrements is apparent in his paintings. His pictures are a valuable record of a mode of transport which, since the development of Turnpike Trusts, had become a relatively speedy (if uncomfortable) alternative to the miseries of road journeys in the earlier 18th century and which for a few decades were at the zenith, prior to the arrival of the railways. As one might expect of a folk-painter, the depiction of the coat-of-arms is not heraldically accurate as Thomas Woodcock, Garter King of Arms has confirmed, though Cordrey has used the Garter around the arms, suggesting he had intended to depict the coach and four of a Garter Knight.